Cup of tea while you charge your car? | What Car? Cup of tea while you charge your car? Four Japanese car makers have formed an association that aims to increase the number of fast-charge points for electric cars around the world. Mitsubishi, Nissan, Fuji Heavy Industries (parent company of Subaru) and Toyota have formed the CHAdeMO association, which they hope will advance the use of electric cars by making improvements, and standardising, quick charging methods. 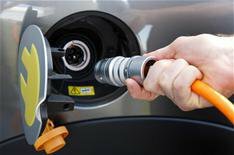 The association wants more than 150 businesses and government agencies to join it, including other car makers, utility companies, charger manufacturers and charging service providers. CHAdeMo is an abbreviation for 'Charge de Move', French for charge for moving. It's also a pun on the Japanese phrase 'O cha demo ikaga desuka', which translates as 'let's have a tea while charging'. This might seem far removed from real-world driving, but if the name is designed to imply you can recharge in the time it takes to have a cup of tea, electric cars would certainly become more appealing. So, we could see 'CHAdeMO' charging stations next to hot beverage franchises in years to come.